A gift of your life insurance policy is an excellent way to make a gift to Claremont McKenna College. 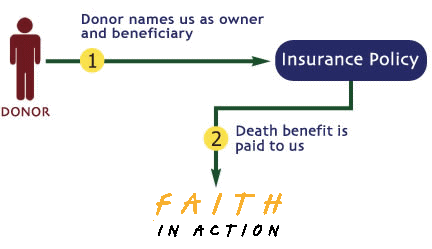 If you have a life insurance policy that has outlasted its original purpose, consider making a gift of your insurance policy to Faith In Action. For example, you may have purchased a policy to provide for minor children and they are now financially independent adults. To make a gift of life insurance, please contact your life insurance provider, request a beneficiary designation form from the insurer and include Williamsburg Area Faith In Action, Inc. as the beneficiary of your policy. If you have any questions about gifts of life insurance, please Contact Us. Call 757-258-5890 or email bminett@wfia.org. We would be happy to assist you and answer your questions.